When in Turkey the obvious side excursion is a visit to Greece, isn’t it? Well from Kas, in the South West it is. 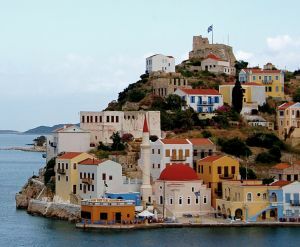 Floating in the sea, just 6km from Kas harbour, is the island of Meis (or Kastellorizo in Greek). Part of the Dodecanese island chain Meis is just 5 miles square, and interestingly twinned with Perth in Australia! Don’t be fooled by its size, whilst small in nature, its history runs deep and long. The island itself holds a strategic position between Europe and the Middle East, and has consequently been re-conquered countless times through history. Right now it is back where it started. Greeks first colonized it, before it was overrun by Crusaders. Inhabitants endured varying types of Egyptian, Italian, Ottoman, French, British, and Spanish occupation thereafter. It is now experiencing more peaceful times and makes for a beautiful day trip. As the boat enters the U-shaped harbour, a rainbow coloured terrace of houses greets you. Each is slightly different – varying Anatolian windows, balconies and decorated front doors show each property’s independence – yet they fit perfectly together. As you disembark the choice is turn left or right. Turn right its small, local, bars and restaurants, turn left and you’ll hit the mosque. In its current incarnation it is the local museum and worth a visit to get a real sense of the past. Photos, letters, ancient documents, china and glass relics give a sense of the turbulent past. Continue on from the museum and a walk along the coastal path takes you to quiet bays where small bed and breakfasts sit at the waters edge. A side path leads to the castle, now in ruins, that once overlooked miles around. 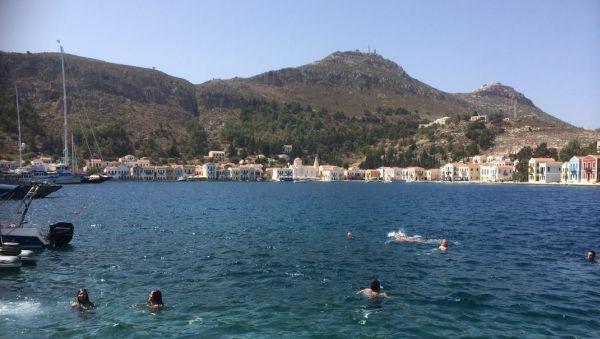 The harbour is probably one of the few left in Europe where you can sip a drink, and then pretty much strip to your bathing costume, dive into the sparkling water, and take a swim before drying out with refreshed drink in hand. Turtles enjoying harbour treats may accompany you. With seemingly no fear, or perhaps no awareness, the turtles surface sporadically and it’s a favourite visitor past time to sip an Ouzo and guess where the next head will appear, breaking the water’s surface. It’s worth a day trip to this pretty little spot, but be prepared to give up your passport for a while, as each visitor has to be registered by the Greek tourist board. They are kept safe in the boat captain’s brief case and are returned to you on your way back to Turkey. Part of me wondered if they want to make sure you don’t stay on the Greek island when you could be enjoying Turkish delights. 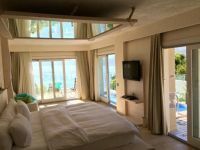 As tourism strengthens this little island economy a couple of smaller boutique hotels have opened and it is becoming increasingly popular for visitors to make the short boat ride from Kas, about thirty minutes, and spend a couple of nights in the quiet harbour. It is an idyllic retreat. If a short boat ride isn’t quite enough then take a walk along the harbour front of Kas and sign yourself up for one of the daily gulet, Turkish wooden yacht, tours. An earlier Elixir boat trip was curtailed by strong winds, so we decided to head for the sea again. Each evening in Kas harbour a multitude of gulet captains promote their offering. It’s hard to choose from so many boats, but the family running Tufan II are charming. Three generations of them sat chatting and relaxed at the stern of their boat. There was no hard sell, just a genuine happiness to have you sign up to spend the day at sea with them. Boat sizes vary but Tufan was about perfect, restricted to just 12-15 guests giving plenty of room for all. 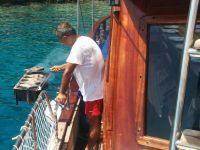 Mainly Turkish guests joined our trip as the captain headed to a variety of peaceful coves where the option was to do nothing, to swim, read or snorkel. Nothing was too much trouble for the family. A selection of salads featuring just about every vegetable known to man were accompanied by freshly baked cheese boreks, filo style rolled pastries stuffed with cheese, and fish cooked on the boat’s grill, which hung precariously over the side. The captain also promised us swimming with turtles and sure enough at the last spot of the day an hour was spent following an oblivious turtle as it nibbled its way along the seabed. A sun and swim filled day leaves you relaxed and refreshed, but a little salty skinned. Deep cleansing is required. I could see my toes, the rest of me was hidden beneath a fluffy, white layer of sparkling, effervescent, bubbles covering me, and the warm marble table, on which I was laid out. 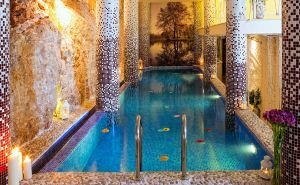 I was in the spa of The Peninsula Gardens Hotel, precariously situated on the edge of Kas’s Cukurbag Peninsula. The Peninsula Gardens is renowned for its exclusivity and has a host of leading travel accolades confirming this. 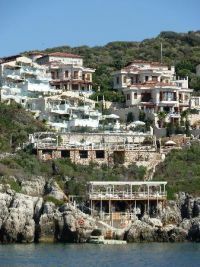 It stretches over the craggy, coastal rocks that lead down to the Mediterranean waves lapping at the limestone. The intriguing design features exposed rock, juniper wood and glass. Most of the serene white rooms have a plunge pool so no need to leave the comfort of your own space, yet if you do there’s an infinity pool, open air bar, restaurant and a collection of sun terraces with double day beds, some of which can be privately booked. The majority of the 18 rooms face west, treating guests to fabulous sunsets. 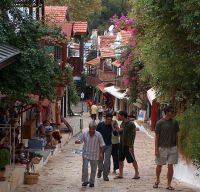 The isthmus connects you to the charm of Kas, but leaves you feeling truly disconnected from the world. The spa has been carved into the limestone keeping it fresh and cool. The cave-like walls appear to fall into the indoor pool, whilst Doric columns support the roof. It’s the perfect soporific space, and the centerpiece for the spa is the hammam (Turkish Bath), where I was now sinking beneath bubbles.